My paintings of historic Native American cultures offer a glimpse into yesterday: You can see what people wore, what tools and weapons they used, or what activities they undertook in their daily lives. You might think gathering all my data for a painting means spending my time in museums or with my nose in a reference book. I conduct research, of course, but my secret to successfully representing cultures from yesterday is to draw inspiration from people of today. To that end, I rely on both visual input from models and narrative input from stories by people who have experience with traditional lifeways. Because the inspiration from living people is so important to my work, I’ve created this miniseries of articles to introduce my fans to some of the members of contemporary Native America that I have been fortunate enough to meet. LeAnn Murphy lives in Arizona and is a stay-at-home mother of three children: Colin, age four; Leah, age two; and newborn Keira Skye. LeAnn models part-time for artists at the Scottsdale Artists School, where she is in demand due to her classic beauty. I met LeAnn after she found me on Facebook and contacted my studio to inquire about modeling opportunities. I am always looking for models with that certain “spark” in their appearance; LeAnn fit the bill perfectly. LeAnn will be modeling for me in 2013 when I arrive in Scottsdale for the Celebration of Fine Art show. Question: What is your heritage? 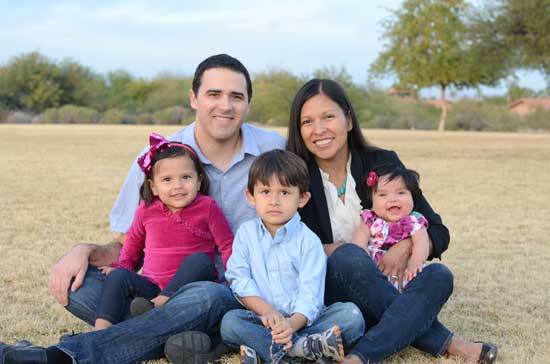 >Answer: I was born on the San Carlos Apache reservation and raised in Scottsdale. I now live in Cave Creek. I have family who live on the reservation, so we visit frequently. What can you tell me about the Apache language? There are different dialects of the Apache language; the Apache from San Carlos speak differently from people on other reservations. The language is mostly verbal. My uncle has worked with anthropologists from the University of Arizona to get it recorded. Part of my family speaks the language and part doesn’t. I cannot speak it, though my uncle tries to teach me. My cousin who grew up on the reservation understands the words, but cannot speak much of it herself. I would love to be able to speak Apache and want my children to be able to speak it, even though it is not a very common language. The community college on the San Carlos reservation teaches Apache occasionally; I think that’s probably the only way my kids will be able to learn to speak it. How important is Native American culture to you? 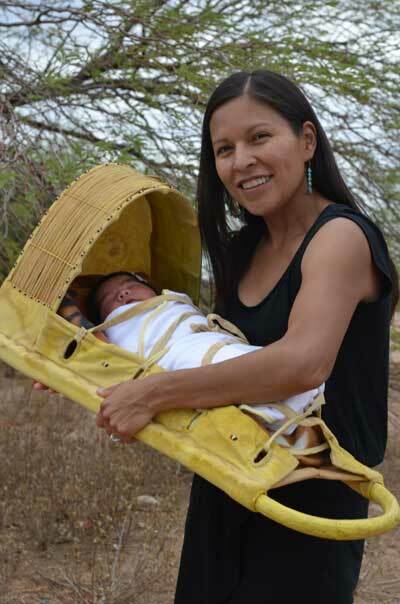 The Apache culture IS who I am—and the older I get, the more I appreciate that. I love learning the history of where I came from, what my people went through, and our evolution as a strong, proud people. When I was younger, that aspect of my heritage didn’t matter to me as much; I was an “urban native girl.” Now that I’m older, I want my kids to grow up to know their history, their culture, and the Apache arts. My husband is of Irish descent, so we make sure our children see both sides of their heritage. The kids see the Irish music and dances and also go to the reservation and to pow-wows. What are your thoughts about my work? Why do you want to model for my paintings? Your work makes me proud of my heritage—even when I see a painting from a culture that isn’t my own. I am proud of my connection as a Native American when a see a warrior’s strong face and beautiful coloring. When I look at your paintings, I can picture myself in that setting. I can see the whole story in my mind. That’s what brought your work to my attention in the first place. How do you feel about me painting Native American cultures when I am not Native American myself? I’m fine with it. American Indian cultures are beautiful I can understand why people are fascinated with them. Personally, I find the Japanese culture beautiful and I’m not Japanese! But that doesn’t mean I cannot appreciate it. I’d like to thank LeAnn for giving me the opportunity to share her thoughts. LeAnn will be modeling for me live at the Celebration of Fine Art show this year. Please sign up for my mailing list to receive notification of when she will be at the show. You can expect finished paintings featuring LeAnn by the end of 2013. Part II of this miniseries on the people who inspire me features Navajo master weaver Pamela Brown. Please click here to read more: About Navajo Master Weaver Pamela Brown. Copyright 2019 James Ayers. All Rights Reserved.